For people in parts of Central, East Gippsland, North East and West and South Gippsland Forecast Districts. Issued at 5:02 am Tuesday, 12 February 2019. Vigorous cold front on Tuesday. A vigorous cold front will move across the State today. East Gippsland and West and South Gippsland districts. Winds are expected to ease during the late afternoon. 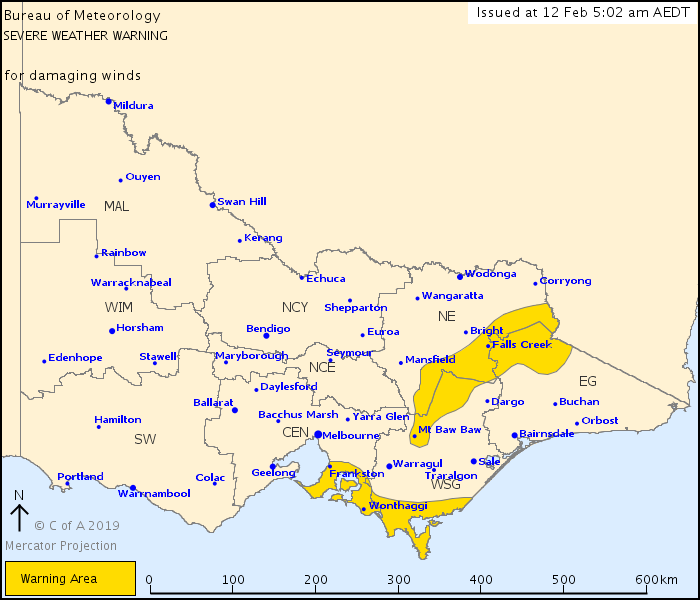 Damaging wind gusts around 90 km/h are also possible about coastal areas of the Central and West and South Gippsland districts late Tuesday morning as the front moves through.